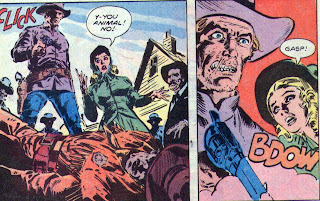 Matching Dragoons: Jonah Hex #44 "Showdown of the Century"
Jonah Hex #44 "Showdown of the Century"
Part 3 of our epic (and the start of basically an almost 50 issue run) has Jonah Hex and Marshall J.D. Hart pulling themselves out of the river and the Spast boys are drawing a bead on them. Hart is hit first and Jonah runs over to him, throws him over his shoulder and heads back to the river. Before Jonah can make it to the safety of the water, he too, is hit and crashing through the cat-tails before they both sink below the surface. The Spast boys search for the bodies which never surface so the brothers leave, convinced they have killed both the lawman & the bounty hunter. However, Hex and Hart have both survived by breathing through the broken cat-tails that Hex grabbed as they went down. Hart, with a head wound ends up getting carried by Jonah for several miles before they can find a farmhouse. The farmer treats Hart's head wound and Jonah's shoulder wound. He also tells Hex that both of their horses showed up a couple of hours earlier. Probably because the Apache thinks it is bad medicine to keep belongings of those that escape. Jonah writes a note and tells the farmer to give it to Hart when he comes to. Jonah then mounts up and heads for Feldon's Gap. Meanwhile, Mei Ling is leaving the farmhouse where she has been recovering and she is heading for Feldon's Gap as well to check on Jonah. Her leg, badly sprained and not broken, is only slightly bothering her to the point where she has to use crutches to get around. She drives a buggy into town and hobbles into the saloon asking about the whereabouts of Jonah Hex. 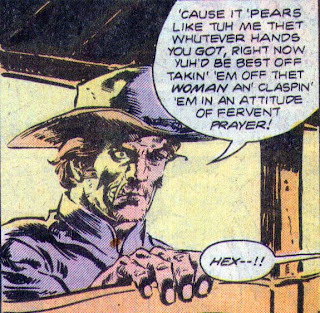 Sadly, the Spast brothers are at the saloon and they inform her that Jonah Hex is dead and that they are supposed to 'take care' of any women that come asking about Hex. Mei Ling starts crying and demanding that they release her when Jonah walks into the saloon. The Spast brothers grab Mei Ling, using her as a shield but she ends up biting the hand of the brother holding her. Jonah shouts for Mei Ling to hit the floor. She hits the floor, crying "Jonah, please". Jonah opens fire, shooting over Mei Lings body and killing all four of the Spasts. Jonah tells Mei Ling that he has to clear himself of the murder charge and then he'll be done with the gunfighting. J.D. Hart has come to and is having dinner with the farmer and his family. Suddenly a lit lantern comes crashing through the window and sets the cabin on fire. Hart tells them to smother the flames and the farmer explains that he is being run off of his property. Hart has the farmer help him up the chimney with a rifle. Outside, several men on horseback are firing into the house, waiting for the family to come out. Hart makes it to the roof and jumps off the roof, knocking out two of the men. He punches out another one, clubs a fourth on the head with the rifle, knocks out a fifth and shoots the rifle out of the hands of the last man. he takes them all into custody and they head off for Feldon's Gap. Back in town, Mayor Bilgewater is worrying. 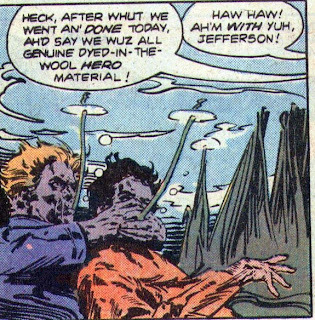 Worrying about the plan to run people off their land before word leaks out about the railroad coming through, worrying about getting rid of Jonah Hex, worrying about J.D. Hart possibly learning about everything. His cohort walks in and tells him that Hart is in town and is gunning for Hex, so all of their worries may be over. Out in the street, Hart has called Hex out and is arresting him. Hex protests that he has been framed but Hart is having none of it. Hart pulls his gun and Jonah pumps three quick rounds into him. A doctor runs out into the street, leans over Hart and announces that he is still breathing. Hex kicks the doc in the ribs, stands over Hart and coldly plants another slug into the downed lawman. Bilgewater's cohort, having witnessed the entire thing, runs back to the mayor and explains that everything has gone to hell. Just then Hex walks in and sits down. Jonah tells them that he is on to them and since he is getting married, he wants whatever cut that Sugar Wallace was getting, plus a third of the bank loot. They tell Jonah their entire plan, including killing Jeffries and that's when Jonah asks if J.D. heard everything. Hart walks in and Jonah states that they have just done the greatest performance since the Booth brothers played Hamlet. 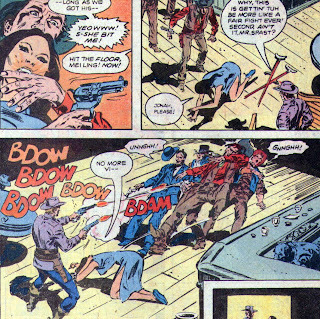 The entire shootout was a ruse to make the banker and his bunch think that Hart was dead and then confess to framing Jonah. Hart arrests the men and takes them to jail. The next day, Jonah and Mei Ling are strolling and talking with Hart. Hart says that he's glad the shootout was fake since he didn't want to go up against Jonah. 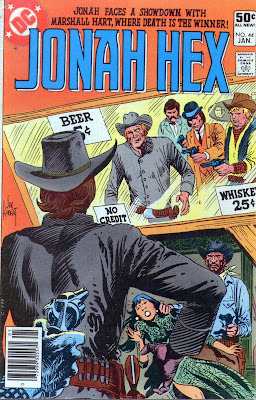 Jonah states that there will be no question as to who will be the fastest gun since he will be hanging his pistols up. Mei asks Hart to stay for the wedding, but J.D. has trouble up in Lincoln county that he has to handle. Jonah mentions that they may settle here since Mei Ling has a brother in the area. Jonah and Mei Ling ride off in a buckboard and J.D. Hart, watching them leave, ponders at the strangeness of Jonah hanging up his guns. He knows that some men get settled down "but other men, and I think Jonah is one of them, well, it seems like the good Lord above just did not mean for them to be happy." More ominous words were never written. Timeline - This one spans two days with the bulk of the action taking place in the first day and then the next day Jonah & Mei Ling riding off. What year does it happen? No clues here but we'll probably have to come back and retrofit a year in here somewhere. Of the three issues in this arc, I enjoyed this one the best. The art was better and we didn't see so much of Hart's homelife, so it wasn't so sappy goody goody where he was concerned. I do wonder about the fake shootout that has no blood. How believable could that have been, especially since Jonah shot Hart at point blank range after he kicked the doctor outta the way? Next Issue: "Blood Wedding"! What else do I hafta say? I know I was being a bit snarky about Mei Ling, but I have to say that Hart drives me almost as batty. A nice story though, and is that DeZuniga artwork?